Luke 2: 1-7 ... And it came to pass in those days, that there went out a decree from Caesar Augustus, that all the world should be taxed. ... (2) ... (And this taxing was first made when Cyrenius was governor of Syria.) ... (3) ... And all went to be taxed, everyone into his own city.... (4) ... And Joseph also went up from Galilee, out of the city of Nazereth, into Judea, unto the city of David, which is called Bethlehem; (because he was of the house and lineage of David:) ... (5) ... To be taxed with Mary his espoused wife, being great with child. ... (6) ... And so it was, that, while they were there, the days were accomplished that she should be delivered. ... (7) ... And she brought forth her first-born son, and wrapped him in swaddling clothes, and laid him in a manger; because there was no room for them in the inn. Matthew 2: 1-2 .... Now when Jesus was born in Bethlehem of Judea in the days of Herod the king, behold, there came wise men from the east to Jerusalem, .... (2) ... Saying, Where is he that is born King of the Jews? for we have seen his star in the east , and are come to worship him. Luke 2: 8-12 ... And There were in the same country shepherds abiding in the field, keeping watch over their flock by night....(9)...And, lo, the angel of the Lord came upon them, and the glory of the Lord shone round about them: and they were sore afraid. ... (10)... And the angel said unto them, Fear not: for, behold, I bring you good tidings of great joy, which shall be to all people. 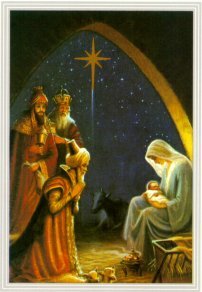 ...(11) ... For unto you is born this day in the city of David a Savior, which is Christ the Lord. ... (12) ... And this shall be a sign unto you; Ye shall find the babe wrapped in swaddling clothes, lying in a manger. (13) ... And suddenly there was with the angel a multitude of the heavenly host praising God, and saying, ...(14) ... Glory to God in the highest, and on earth peace, and good will toward men. 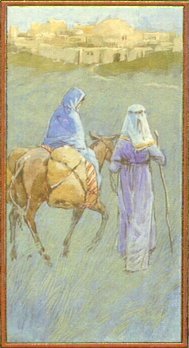 ...(15) ... And it came to pass, as the angels were gone away from them into heaven, the shepherds said one to another, Let us now go even unto Bethlehem, and see this thing which is come to pass, which the Lord hath made known unto us. ... (16) ... And they came with haste, and found Mary, and Joseph, and the babe lying in a manger. ...(17) ... And when they had seen it, they made known abroad the saying which was told them concerning this child. ...(18) ...And all they that heard it wondered at those things which were told them by the shepherds. ... (!9) ... But Mary kept all these things, and pondered them in her heart. ... (20) ... And the shepherds returned, glorifying and praising God for all the things that they had heard and seen, as it was told unto them. This Year as you celebrate Christ's birthday, when you look at your tree Try looking at it a little differently this year.. When you see a tree remember a cross.. When you see the gifts remember the giver of gifts and remember the greatest gift ever given to man in the gift of God's Son to all mankind.. When you look at the lights, remember How Christ has lighted your walk through a dark world.. When you look at the evergreen remember everlasting life in Christ Jesus.. 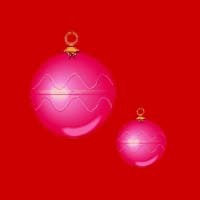 When you see the differently colored lights, remember Christ is the Savior for all people everywhere and to all that will accept Him as their personal Savior.. Christmas is not the gifts we will receive but rather is the gift we have already been given.. Without the virgin birth, our Savior would be just another man, but you and I know He was the son of man and also the Son of God.. On His mother's side He was thirty three but on His Father's side He is the Alpha and the Omega..